I love to watch Mike Vick play some football, but it looks like it could be a solid year before he sees grass with a stadium surrounding it rather than a field enclosed in barbed wire. In the meantime, there's always the Michael Vick Chew Toy. According to the P&C and the SCDMV, South Carolina has a new license plate, and I'm not at all a fan. I voted, but not for this one. I think it's rather hideous and just plain unoriginal. I knew I've seen something just like it before. But where? Oh yes. Now I remember. That's a second-rate knockoff of a discontinued Michigan license plate. One must also wonder, why should every driver in the state be relegated to running around with free, legally mandated tourism advertising. That smells like a fishy nod to the coastal half of the state. Here's a big BOO to whoever voted for this hideous thing to be attached to the back of my car and an ever booier BOO to the goober who came up with that web address. Our apartment is finally in order. After plenty of arguments, including one or two over where to store envelopes, we've finally made our peace, signed a few treaties, and settled in. We went to the Hwy 21 Drive-in near Beaufort and watched some movie with people pretending to be gay. But they weren't, and it wasn't that good anyways. While we were in the area, we stopped by the Old Sheldon Church for a gander and a picture. We did a little random sightseeing as well. I filled my first tooth a few weeks ago. It was a 90. I've heard that 100's don't exist. 95's are reserved for when the attending remarks, "that's better than I could have done." 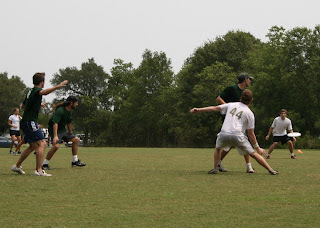 I also played in the Charleston summer ultimate frisbee tournament in who knows how hot kind of weather. Unfortunately we have no pictures of the damage it caused me or the damage I caused. Amber says I was "out of it." DK and Morgan did too. Let's say that my record for not spewing has ended at ten years. 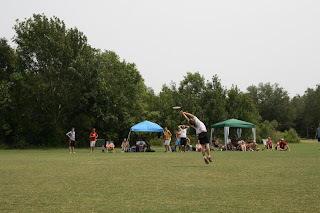 All I know is that I was uncoordinated and a little slow in the head. As a write, Amber has corrected me to call it "slightly delusional." I've learned my lesson about running around in 100 degree weather. Or 98 degree weather, or whatever it was. Details are somewhat fuzzy now.